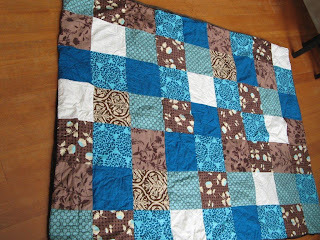 One of the big blues quilts. I love the legacy of quilting. I love the history and that it can be so forgiving. I am the absolute last person who should be sewing (or so I thought). I NEVER in life measure twice and cut once. I thought that could only create mayhem in sewing and carpentry. Potentially areas of life too. However, in this type of quilting, the uniquenss, the undetailed details, they also tell a story. A harried, happy life, of hidden stitches and quick and dirty muddling on.